"They're 5 sized PCR fragments (roughly 150, 300, 500, 700, 1kb), I went back through my notes to find 5 primer pairs that I knew worked pretty well (so don't feel bad, they're selected out of primers that had been pre-validated =p). The other lanes are just mixes of the 5 sizes (either 2:3:4 or 4:6 volume mixes going in decreasing size, since larger fragments tend to be brighter). The gel actually didn't take that long (though it was terrifying loading it), but I made a mockup in Illustrator beforehand (along with a ladder to test what sizes to use), and then sketched it out beforehand so I knew what to add to each lane. 700 was the hardest to find for some reason, so I didn't really care about whether it was perfect or had primer dimers (and yeah I've had a friend complain to me about that also). 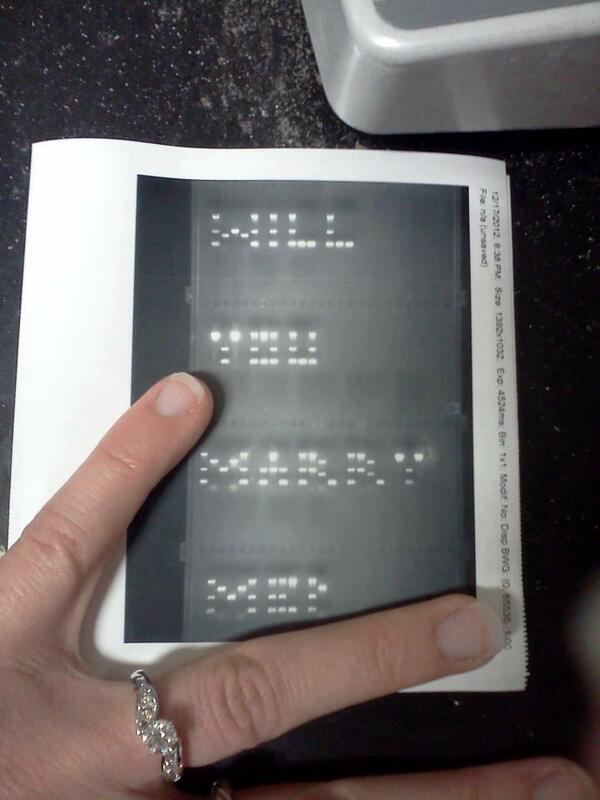 The most difficult part of the entire thing was actually coming up with a good enough excuse to get her to image a gel in my lab! And meeting a girl nice enough to actually agree to do that while believing it was my real work! The actual proposal occurred a couple minutes after and involved flowers (outside the building - the gel was fun, but I decided a long time ago I didn't want to actually propose in any place with as many cockroaches as our lab buildings =))"